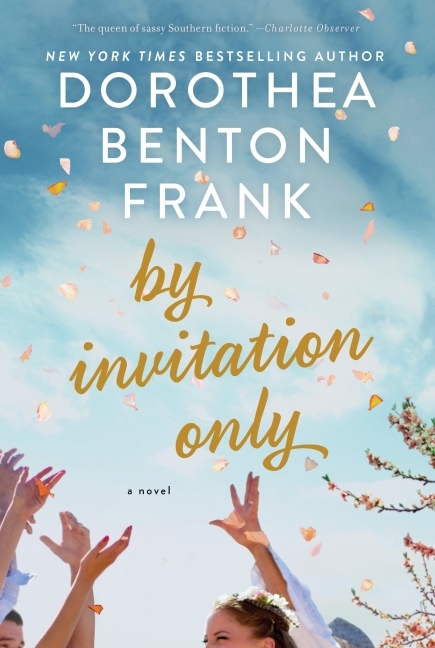 Everyone loves a wedding story and so By Invitation Only by Dorothea Benton Frank was a welcome distraction in my reading schedule. My thanks to TLC Book Tours for sending me a copy at no charge for my honest review. I am always amused in how things play out with the books I read. As I’ve mentioned many times before I accept the books somewhere around 4 and 6 months ahead of when I post my review. The requests come at all different times. And here I had two books by this prolific author within two weeks. Be sure to check out my review of Same Beach Next Year. I was drawn to this book for a number of reasons; I love a good romance story, peaches are my favorite fruit and I always figure I’m going to need a light read here and there in my schedule. Ms. Benton Frank has, in the books I have read from her, always provided me with good, escapist reading. By Invitation Only is my favorite of her books that I have read. Fred and Shelby are getting married. Fred is the child of a long line of peach farmers from Georgia. The family is rich in love, quirkiness and peach jam but not in cash. Shelby is the child of Chicago’s elite social scene. To her mother status is everything. To Shelby, Fred is everything. Her parents are not completely sure that Fred’s family are good enough but if Shelby is happy…. The two families meet for the first time at an engagement party thrown by Fred’s mother – his father is not in the picture. To say there is a culture clash is to make an understatement but most of the problem is in the refusal of Shelby’s mother to think that anything she didn’t plan is acceptable. She also has the idea that it’s HER wedding, not her daughter’s and is going just a teeny, tiny bit overboard. Disasters soon strike both families and the ties that bind will be severely tested. Through it all the love that brought Fred and Shelby together only grows stronger. Home can be many different places but family is always there to welcome you there. I thoroughly enjoyed the characters and varying plots in this book. I felt right at home i;n a place that was cooking and canning. The characters were all unique and quirky. At times I liked them at times I wanted to throttle them which to me makes them quite real. Some of the plot points were a bit over the top but reading one of these books isn’t about reality is it? It’s about escaping reality for a little while and immersing yourself in another life. By Invitation Only lets you do that.